Stereotypically speaking – which is never a good way to go – the word ‘epic’ and the phrase ‘epic fail’ are socially seen as the most overused words by the considered video-game-and-anime-loving-nerdy-types. As inaccurate as the stereotype may be (or accurate in some cases), I for one was wondering what was going on at E3 last year. 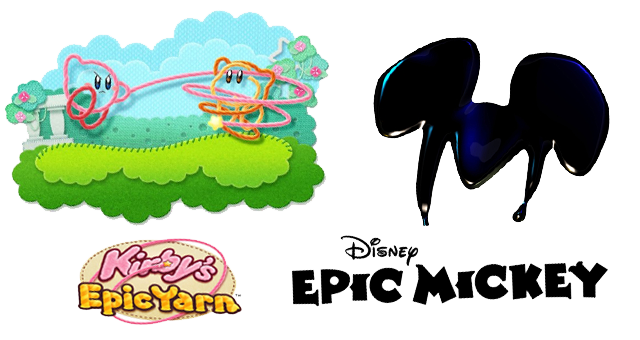 Epic this, epic that, Disney Epic Mickey and Kirby’s Epic Yarn. Nintendo had no shame adhering to the epic stereotype, making it the most overused word at E3 last year. Now that both Epic Mickey and Kirby’s Epic Yarn have met their releases all around the world, and had time for players to experience what they’re both all about, it’s time to ask the question of which is better? How do they match up? Are they truly epic, or are they epic failures? Applause must be given the Kirby’s Epic Yarn for having one of the cleverest game titles ever. Sure, it is far from what would typically be considered an epic, but that just adds a sense of irony – a part of the humor that permeates the game. Besides, it’s forgivable when the genius double meaning of the word ‘yarn’ in the title hits you. The puns don’t stop there though, because the game is full of classics such as what plans is Yin-Yarn (the antagonist) ‘stringing together’. The game has no problem at all roping you in! Epic Yarn’s main criticism is that it is too easy. Now while the game does do away with lives, making it impossible to actually die or have a game over, I would like to rebut the argument that it’s too easy. 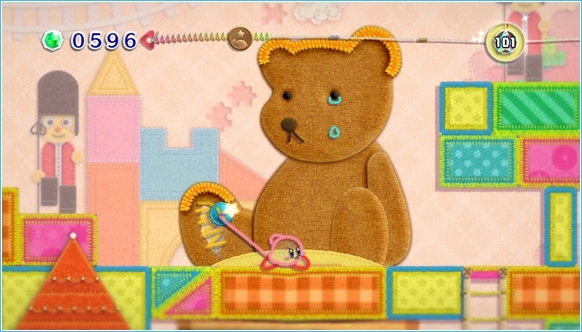 Kirby’s Epic Yarn is not meant to be hard. It’s supposed to be a bit of good-natured fun. The type that always puts a massive grin on your face – which it does. With that said, there are some portions that are slightly challenging to actually pull off, even though dying is factored out. I would have died plenty of times, if it were possible, especially on some of the boss fights. As you play through this sidescroller, it’s not about the difficulty, it’s about the amazing amount of concepts and power ups that Hal Laboratories has crammed into the adventure. The game is full of unique and fresh concepts, and every level has an extremely different feeling, just like many say was apparent in the two Mario Galaxies. The main downside is that it is over all too quickly, but the replay value is infinite. There are 50 levels in total to unlock, and playing them over and over doesn’t get old. It’s just too cute, and it’s a game that I’ll be keeping to share with people. Alone it’s great. With others it’s much better. The co-op mode is well done because player two has just as much they can do as player one, and unlike in New Super Mario Bros. Wii at times, you don’t get in each other’s way. The soundtrack added tremendously to the whole experience. Some catchy and peaceful pieces, including acoustic and piano scores, made the levels so much better all round. Mind you, with the way Kirby and Prince Fluff act on both the foreground and background of the levels, the game would still be damn good without music – it only served to make it so much better. The music, along with the game as a whole, had no issues hearkening back to classic Kirby, including appearances from all of the notable characters that you would want in a Kirby adventure. It’s great fun for new players to Kirby, and has enough there to cater to the Kirby veterans. As for myself, apart from Kirby’s Dreamland, I’ve been hesitant on Kirby titles in the past and was hesitant on this purchase, but it delivered far beyond what I expected. Just know that you’re in for some light-hearted fun without expecting the biggest challenge you’ve ever had, and this title delivers in abundance. Epic Yarn was co-developed by ‘Feel Good’, and while epic is not the most accurate adjective for it, it sure does feel good. A cute and touching moment. Disney is not my thing, it never has been. 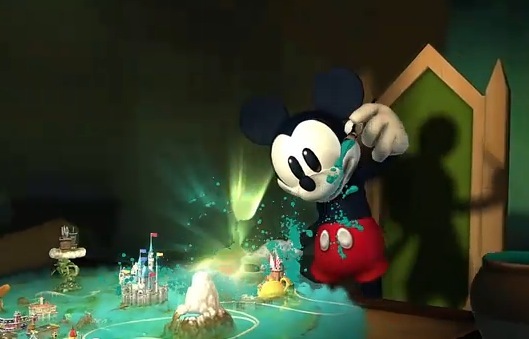 However, having seen the trailer at E3 and subsequent introduction footage, Epic Mickey looked too good to pass up. Unfortunately, looks can be deceiving. Either Epic Mickey’s title is making a claim that it truly doesn’t deserve, or more realistically, the phrase ‘epic’ should be read as ‘classic’, or ‘nostalgic’. That is because the game’s story is all about the forgotten Disney characters of the past such as the legendary Oswald the Rabbit – who really is much better than Mickey. The story itself is quite ingenious, with so many characters approaching Mickey and hoping that he remembers them from the one or two episodes they appeared in, however, he has forgotten them like we all have. In fact, Wasteland is the home of the forgotten, established by Oswald. One particularly clever and touching part is when Mickey finds a statue made by Oswald of Walt Disney holding Oswald’s hand – modeled exactly after the real-life statue of Walt Disney with Mickey. The stories’ concept is fantastic, but the delivery of the story that drives the events within Wasteland is rather weak. At times you wonder what exactly you’re doing, and it monotonously just becomes completing quest after quest – an aspect of gaming that makes games seem really forced and dragged out. The gameplay itself suffers from the same issue – it’s a great concept, but executed badly. Throwing paint and thinner around gets old surprisingly quick. Mostly because there are only very minor upgrades and improvements to your abilities. Eventually you’re just doing the same thing over and over – thinning and painting platforms to get across gaps, or painting in gears to make things spin. It is fun at first, but not after 17 times. Some people have found the game fantastic, and that’s their prerogative, but lack of advancement and new puzzles makes for a great concept that is poorly executed, and it lets the whole game down. It does try to be ‘epic’ – in all meanings of the word. The logo, the menu, the title screen and even the music. Epic was my very thought as the game started, but it was short-lived. The opening intro-cinematic encapsulates the very meaning of epic, but the repetitive gameplay kills the epic-streak dead in its tracks. The Gameplay has its kinks, a lot of them actually. There’s the massive difficulty fluctuation – some bosses are ridiculously easy, and then some standard enemies are hard. Some puzzles are insane, but most are simple. Perhaps the quite-inaccurate-at-times pointer control didn’t help, as well as the poor camera control that basically has you holding C on the nunchuck the whole time if you want a steady-cam. The game was all about choices. Good choices and bad choices. The concept itself was simultaneously a good a bad choice by the developers. A bad choice because if faced with a challenging situation, there was always an easy way out for players. Good because it does allow for some moralistic values between choosing right and wrong, represented by paint and thinner respectively. Unfortunately, the choice mechanic does at times just lead you to dead ends of wondering what exactly you should do. I truly wanted so say ‘oh Mickey you’re so fine’ in this review, and I have, but it can’t be applied to the game itself. Even with all of my complaining, it’s not a truly horrendous game – it’s pretty standard. Nothing special or adventurous though. It isn’t unique, but maybe generic games are your thing. Concepts such as playing through old cartoon animations between levels sound good in theory, but get incredibly repetitive when traveling from level to level. For every bad thing, there’s a good thing, such as the cute animations. It’s about balance – between usage of paint and thinner. Unfortunately this balance translated into the mechanics itself, balancing the very good and the very bad to make average. The part that gave me the most joy was the Zelda tribute – “It’s dangerous to go alone. Take this!” – which is quite sad really. Looks good hey? Looks can be deceiving! Kirby’s Epic Yarn was over so quickly. It hardly seemed like any time at all, but it was longer than I thought. They say time flies when you’re having fun. Well, as for Epic Mickey, by the time I’d played it only as half as long as Kirby, it seemed like I’d been playing for way longer. Neither game is anything like the true epics Ocarina of Time and Super Mario Galaxy are, but Epic Yarn achieves exactly what it tries to – a fun time. Epic Mickey unfortunately fell well short. Epic Yarn will be a game that I’ll be replaying many times into the future because it’s just that enjoyable. As for Mickey, well, I believe he can economically give me more value by reducing the price of my Nintendo 3DS as a trade in. Both games share one thing in common, and because of that, have an important lesson within. Both games have great ideas and overarching concepts. Kirby is a the example of how to execute ideas well to make a great game – potentially the best Kirby title ever. I’ll leave that up to you. Mickey shows us that good concepts can’t make a game good and that execution is everything. Good ideas are nothing in the wrong hands.